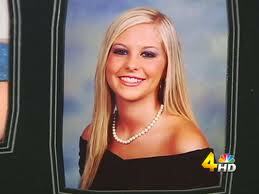 Holly Bobo, a 20 year old student from Darden, TN was reported missing on the night of April 13, 2011. Police believe that Holly may have been abducted from her home in Decatur County, TN around 7:30 that morning by a man wearing camouflage. Holly’s neighbor, as well as her brother who was inside her house at the time, both called 911 when they heard Holly outside screaming early that morning. Bobo’s brother saw the man drag Holly through a carport beside the house and into the woods not too far off behind the home. Last seen outside her one story home 100 miles northeast of Memphis, police are still searching for what they believe could have been a premeditated abduction. Authorities recovered items such as Holly’s cell phone and her lunch bag, which were still intact at her house during the investigation, but police have no leads as to where she might have been taken. The suspect is described as a male, approximately 6’0” tall, about 200 pounds and wearing camouflage. Holly was a nursing student and also the cousin of country music singer, Whitney Duncan. Investigators believe this abduction was planned because of the geographical area Holly’s house was located in. Since the house was located in a heavily wooded area, police think it must have been someone who knew Holly, knew her routine and knew how to get around her property.